The BeBook Neo is the latest flagship ebook reader from Endless Ideas, one of the pioneers of the open ebook reader movement who launched the BeBook One two years ago. BeBook’s strength is their community and developer base which aims to make their ebook readers as versatile as possible, embracing the largest amount of ebook formats available today. 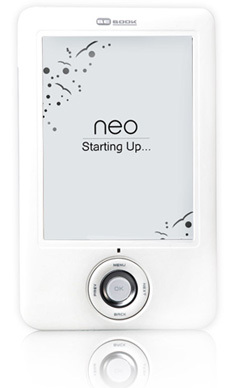 The BeBook Neo is no exception, featuring the same list of available formats including PDF, EPUB, MOBI, FB2, TXT, PDB, HTML, CHM, JPEG, BMP, PNG, TIFF and Adobe DRM’d Epub/Pdf formats. The great thing which separates the BeBook Neo from the Amazon Kindle for example is the ability to buy an ebook from any ebook store and load it up onto the device, sadly the Kindle can only read ebooks purchased from the Kindle store, and non DRM pdfs. In terms of look, the BeBook Neo has a nice plastic front which feels solid, and a metal back. It looks a lot smarter than its predecessor the BeBook One. In terms of functionality, it uses the same 6” 600×800 E Ink Vizplex screen as the BeBook One, which is standard across most ebook readers these days. But the new Sony PRS-650 and Amazon Kindle 3G are now using an improved E Ink Pearl screen which offers better contrast, so this screen is technically inferior. This is not a massive point as you would be hard pressed to really see much difference in most situations, but suffice to say you are only getting 8 shades of grey instead of 16 with the Kindle and Sony ebook readers. The biggest innovation comes in the shape of a Wifi connection, and a built in portal which enables you to purchase books from compatible book stores directly from the ebook reader. Although not as user friendly as the one click purchase offered by Amazon, the BeBook portal works well, and lets you actually buy books directly from your ebook retailer of choice (at the moment the retailers include: Foyles, Blackwell, Whsmith). The bebook also has a limited web browser, which is handy if you find yourself needing to check something whilst at an internet café and a rather good stylus touchscreen provided by Wacom. This combination makes it a breeze to surf, and annotate ebooks. This ebook reader also has a faster processor than most other ebook readers available today, and has quite a quick screen refresh rate – so no more waiting (too long) for pages to refresh. Other than that, the BeBook Neo includes an external SD card slot so you can expand the 510mb of internal memory up to 4GB! This would be enough for a lifetime of reading. In terms of price, the BeBook Neo is currently available at £229/$350. Its not the cheapest ebook reader in the marketplace, but makes up with the ability to use Wifi and load up virtually any ebook. Click here to compare the BeBook Neo to the other 6” ebook readers available today. I like the non proprietary aspect of this one, but is it available in the US? My 7 year old grand daughter is always reading. Someone should make a childrens E Reader with pictures . I’m sure it will be a seller. I know I would definitely get one. Please let me know.